Acrylic POP Display By Doublemint - What Makes It Notable? Acrylic POP Display By Doublemint – What Makes It Notable? Doublemint in Vietnam has come up with a simple yet effective method of increasing their sales for their chewing gum. Not only giving consumers a breath of freshness, but they are also bringing in accessibility with its acrylic POP display! 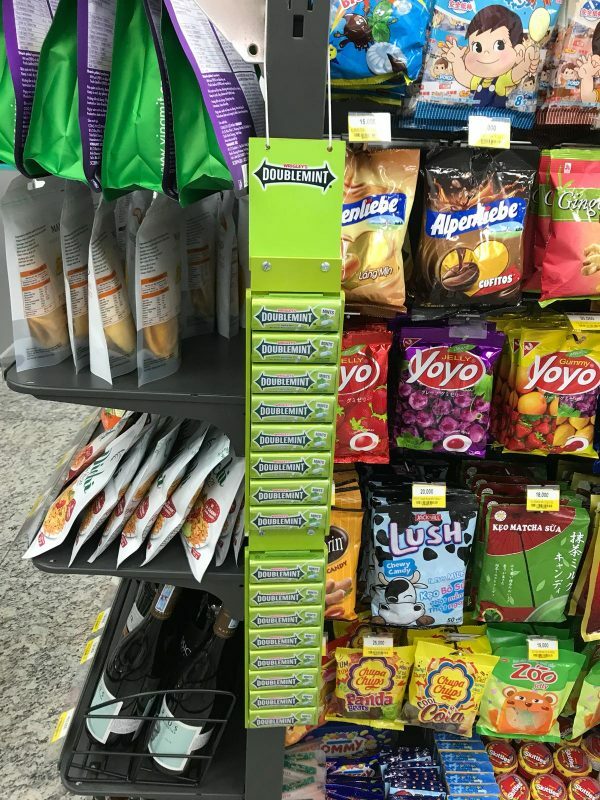 Through this custom POP display, consumers can now easily locate and grab a tin of chewing gum swiftly. The acrylic POP display is positioned strategically and seamlessly incorporated onto the main product rack. This induces consumers to purchase an additional item as it is able to positively pique their interest. Aesthetics and forward planning are surely important in bringing out the best results for brands! What Are The Advantages Of An Acrylic POP Display By Doublemint? Simple & Cost-Saving – The manufacturing process of this custom POS display is fast and cheap since the design is straightforward and simple. This helps to maximize profits while incurring little losses – especially good for small brands. Hence, merely hanging it on the rack can spark curiosity as it pops out unlike the usual arrangement of products in a store. Personal Branding – Customization gives brands a higher competitive advantage as there will be traces of personal branding. Moreover, choosing the color green which is the same as the product’s induces easier association to brand image. Doublemint has overall ensured finer brand remembrance! Brings Convenience – By improving consumers lifestyle, it is a win-win for both brands and consumers – brands gaining traction in their sales while customers enjoy a more positive shopping experience. This successfully builds recognition and trust for brand. A simple POP display has the ability to draw customer’s attention as long as it is designed to stand out from the crowd. Such examples can be also seen from on-pack gift sets, covermount promo gifts and gift with purchase. At ODM, we have great expertise in manufacturing high-quality products. Moreover, we have a team of creative product designers to brainstorm fresh ideas for you. Feel free to send us your inquiry today! Popular Type of POS Display Spotted! Don’t Miss Out on Popular Point of Sale Display Purchases!